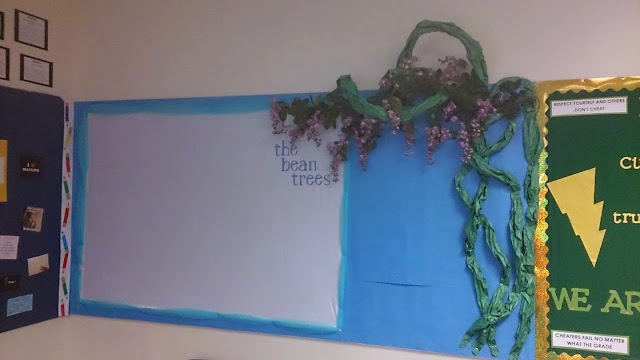 This board was designed for my unit on The Bean Trees by Barbara Kingsolver. As the unit progressed I added student work in relation to plot, character, theme and diction (which is what they were being asked to annotate for). I used green butcher paper to make the wisteria vines and then bought some fake flowers and wrapped them into the vines. Next year I will have to remember to take a picture of the board with content on it. Those are pretty fantastic bulletin boards. I love your bean tree! So pretty!